Sir Cameron Anthony Mackintosh is a British theatrical producer and theatre owner notable for his association with many commercially successful musicals. At the height of his success in 1990, he was described as being "the most successful, influential and powerful theatrical producer in the world" by the New York Times. He is the producer of shows such as Les Misérables, The Phantom of the Opera, Mary Poppins, Oliver!, Miss Saigon, Cats, and Hamilton. 42nd Street is an American musical with a book by Michael Stewart and Mark Bramble, lyrics by Al Dubin and Johnny Mercer, and music by Harry Warren. The 1980 Broadway production, produced by David Merrick, directed by an ailing Gower Champion and orchestrated by Philip J. Lang, won the Tony Award for Best Musical and became a long-running hit. The show was produced in London in 1984 and its 2001 Broadway revival won the Tony for Best Revival. Half a Sixpence is a musical comedy based on the 1905 novel Kipps by H. G. Wells, with music and lyrics by David Heneker and book by Beverley Cross. It was written as a vehicle for British pop star Tommy Steele. Jenna Johan Russell is an English actress and singer. She has appeared on the stage in London in both musicals and dramas, as well as appearing with the Royal Shakespeare Company. She performed the role of Dot in Sunday in the Park with George in the West End and on Broadway, receiving the Tony Award nomination and the 2006 Olivier Award for Best Actress in a Musical for her role. She has also appeared in several television series, including Born and Bred and EastEnders. 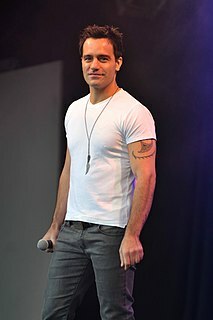 Ramin Karimloo is an Iranian-Canadian actor and singer, recognised mainly for his work in London's West End. He has played the leading male roles in both of the West End's longest running musicals: the Phantom and Raoul, Vicomte de Chagny in The Phantom of the Opera, and Jean Valjean, Enjolras, and Marius Pontmercy in Les Misérables. He also originated the roles of Gleb in Anastasia and the Phantom in Andrew Lloyd Webber's Love Never Dies, which continues the story of The Phantom of the Opera. Kerry Jane Ellis is an English actress and singer who is best known for her work in musical theatre and subsequent crossover into music. Born and raised in Suffolk, Ellis began performing at an early age before attending Laine Theatre Arts from the age of 16. Lee Stephen Mead is an English musical theatre and television actor, best known for winning the title role in the 2007 West End revival of Joseph and the Amazing Technicolor Dreamcoat through the BBC TV casting show Any Dream Will Do. As well as subsequent West End roles in Wicked, Legally Blonde: The Musical and The West End Men, Mead has pursued a music career, releasing three solo albums and undertaking concert tours in the UK and Japan. Hannah Waddingham is an English actress and singer, best known for her contribution to West End musical theatre, particularly her performances in the original London production of Spamalot, the 2010 Regent's Park revival of Into the Woods, and most recently, The Wizard of Oz. She has received three Olivier Award nominations for her work. She has also had a successful film and television career. In 2015 she joined the cast of the fifth season of the HBO series Game of Thrones as Septa Unella, as well as appearing in the 2012 feature film adaptation of Les Miserables and 2018 British psychological thriller Winter Ridge in a primary role. The Bodyguard is a 2012 stage musical written by Alexander Dinelaris, based on the 1992 film The Bodyguard, with the score featuring songs recorded by Whitney Houston including "One Moment in Time", "I Wanna Dance with Somebody " and her cover version of Dolly Parton's "I Will Always Love You". The show began previews at the Adelphi Theatre in London's West End, on 6 November 2012, and officially opened on 5 December 2012. Top Hat the Musical is a 2011 stage musical based on the 1935 film of the same name, featuring music and lyrics by Irving Berlin with additional orchestration by Chris Walker. The show opened on 16 August 2011 at the Milton Keynes Theatre, touring the United Kingdom before transferring to the Aldwych Theatre in London's West End. Top Hat won multiple 2013 Laurence Olivier Awards after receiving seven nominations. The musical closed in London on 26 October 2013, with a UK and Ireland tour commencing in August 2014. The Commitments is a musical written by Roddy Doyle, based on the 1987 novel of the same name, also written by Doyle. Like the novel, the musical is about a group of unemployed Irish youths who start a soul music band. It premiered in 2013 at the Palace Theatre in London's West End. Fatal Attraction is a 2014 play adapted from his original screenplay by James Dearden. It is based on the 1987 film Fatal Attraction, and it opened in London's West End at the Theatre Royal Haymarket on 25 March 2014, following previews from 8 March. The Wind in the Willows is a musical written by Julian Fellowes, with music and lyrics by George Stiles and Anthony Drewe, based on the novel of the same name, written by Kenneth Grahame. The musical received its world premiere at the Theatre Royal in Plymouth in October 2016, before transferring to The Lowry in Salford and the Mayflower Theatre in Southampton. The following year the production transferred to the West End's London Palladium, where it was filmed for cinema broadcast. Mrs Henderson Presents is a musical comedy with music by George Fenton and Simon Chamberlain, with lyrics by Don Black and a book by Terry Johnson. Based on the 2005 film Mrs Henderson Presents, the musical received its world premiere at the Theatre Royal, Bath in 2015 and transferred to the West End's Noel Coward Theatre in February 2016. The film was based on the true story of Laura Henderson and London's Windmill Theatre. Hangmen is a play by the British-Irish playwright Martin McDonagh. It received its world premiere at the Royal Court Theatre, London, in September 2015, before transferring to the West End's Wyndham's Theatre. The play was directed by Matthew Dunster, designed by Anna Fleischle, and featured David Morrissey and Reece Shearsmith among others. It was universally acclaimed by theatre critics, and was nominated for numerous awards including the Olivier Awards, Critics' Circle Theatre Awards and the Evening Standard Theatre Awards. For its U.S. premiere in 2018 at Off-Broadway's Atlantic Theater Company, Hangmen won the New York Drama Critics' Circle Award for Best Foreign Play. The Band is a jukebox musical with music and lyrics by Take That and a book by Tim Firth. Co-produced by David Pugh, Dafydd Rogers and Take That, including Robbie Williams, it received its world premiere at the Manchester Opera House, in September 2017, before embarking on a UK and Ireland tour and opened at the Theatre Royal Haymarket at London's West End in December 2018. The band was cast through the 2017 BBC reality television show Let It Shine.